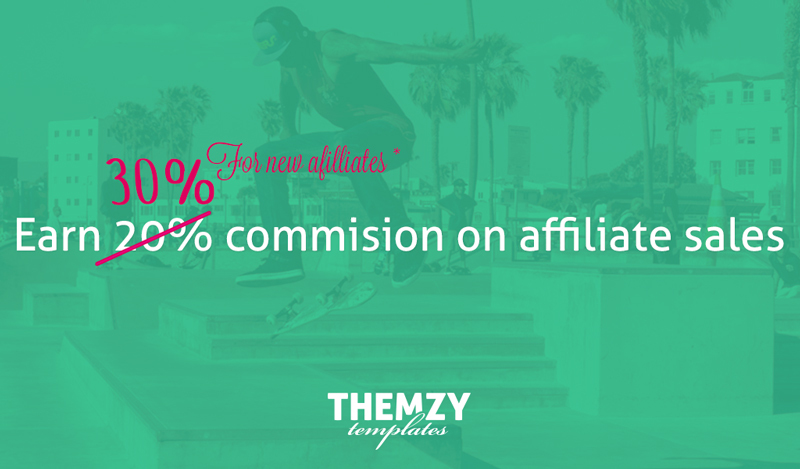 Yes, you heard it right, Themzy is starting a long-term Affiliate program. I already know there are some awesome templates, no doubts about that. However, Themzy really need help to reach as many customers as it can. That is where you step in, join our affiliate program. Our program is starting with the generous commission of about 30%, for a limited time for our first few affiliates. (So it is better to hurry up with registration). You can freely register and after approval, you can start promoting Themzy’s products. I am not a marketing expert, but I will try to give my best to support our affiliates and to provide them with all material needed. I am sure that you have your own techniques: banner placement, promoting blog-posts etc. You will be provided will all graphic material needed, and if you have some specific request I am at your disposal. As you know template and theme business is booming, and with the right strategy and a little patience, we can make this business successful. Cookie duration is limited to 30 days, but it is negotiable. As far as honesty concerns… Listen, I have put my face on these pages and my whole career. I would not let to lose everything just for a few more bucks. I will be honest even with cookie duration. If there is to make it last longer I will do it. I consider my affiliates as my best friends and I will do my best to make a good deal between us. If you know somebody who is “super affiliate” or someone who wants to be, please, recommend him this program. It will mean the world to me.